Let me ask you this: If there's one thing that truly represents Singapore cooking, what would it be? To be really honest, I have yet to really thing hard in order to answer that but I guess the most obvious one would be the Hainanese Chicken Rice. Then again, it is Hainanese and not purely Singaporean so could it be the Char Kuey Teow? Not really sure. I would also say maybe Laksa but I'm not sure where this yummy bowl of noodles originated from in order for me to confidently say it could be "the one". If you know the answer or you have a couple of guesses too, please feel free to comment below. 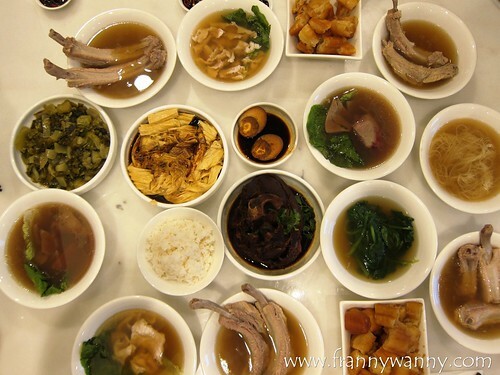 Remember my childhood story about the time that my family and I would always have bowls of bak kut teh whenever we're here in Singapore for a vacation? For some reason, my parents would have it in the morning so we'd be slurping up spoonfuls of pork-based broth early in the morning. Needless to say, bak kut teh holds a special place in my heart as it brings back so much fond memories. So, when I found out that one of the most sought after bak kut teh shop, Founder Bak Kut Teh from Balestier opened it's second outlet closer to town, I was so happy! Hotel Boss is one of the newest hotels in the Lavender district and it's just a block away from the Kampong Glam area which is one of my favorite foodie areas here in Singapore. Easily accessible via train or bus, this hotel, I'd say, is really strategically located. The menu is simple and the price is very reasonable. So for a group of 7 hungry people, the best way is to get practically everything in the menu and share. Yes, sharing is indeed caring. 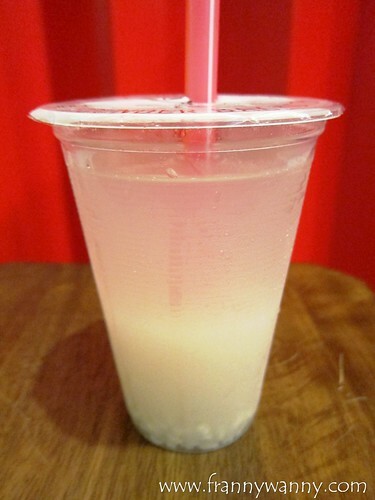 I ordered a glass of Iced Barley Juice to refresh myself as the weather has been intensely warm lately. The Barley Juice was yummy but it was a bit too sweet for my taste. 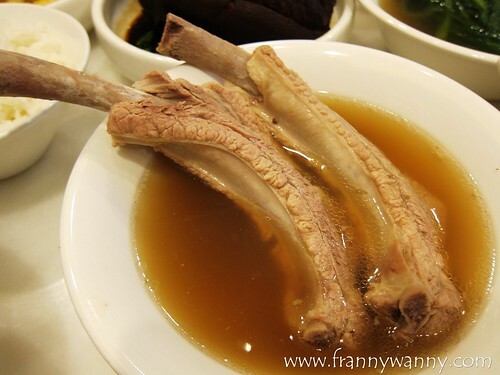 We started off with our own bowls of Premium Ribs (S$11.80) which comes wiith 3 huge ribs. Normally for something this long, you'd expect the meat to turn dry or the kind that gets stuck to the bone. On my first try, I've managed to remove the meat without much effort on biting on the bone. No need to look like a caveman there. You can enjoy your ribs while keeping your poise. The reason why the ribs are so tender comes with decades of practice and expertise of Mr Chua Chwee Whatt, the founder of the restaurant. Apparently, he used to be a hog farm back in the 1960s so he surely knows his pig/pork very well. For those who wants it a bit more manageable, try the Premium Short Ribs (S$10.80) which have shorter bones yet the same amount of meat portion. What I love is the peppery garlicky soup broth. If you're like Paul who loves soup, good news is they'd gladly refill your bowl at no extra cost. You can drink to your heart's delight without hurting your wallet. 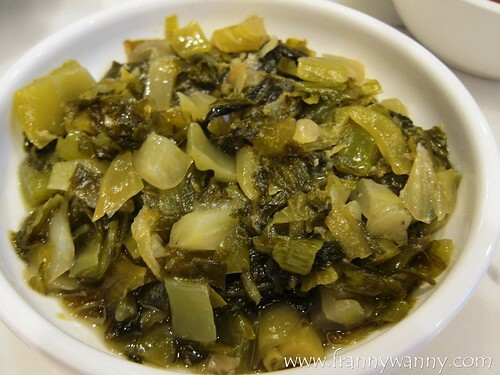 To go with our bowls of bak kut teh, we had a couple of side dishes which I love love love! Starting off with the Salted Vegetables (S$3.80 / S$5.80) which we normally call "kiam tsai" in Hokkien. This version has a strong flavor of the star anise which I love. I also noticed that it's not as salty as I was expecting it to be. To be honest, I would gladly have a bowl of Premium Ribs and the Salted Vegetable for lunch any time. If you love beancurd skin like my hubby then you have to try the Tau Kee (S$3.80/S$5.80) too. 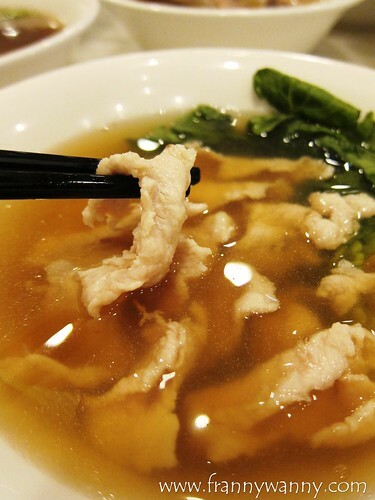 It's silky beancurd skin simmered in their homemade broth allowing the flavor to get soaked into the skin overtime. 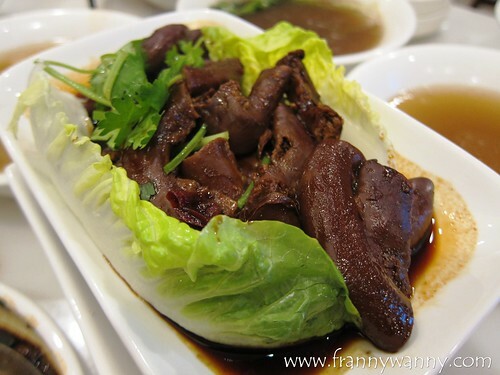 Another side option is the Braised Pig Intestines (S$8.80 / S$11.80). I have to say that while this may not be the healthiest option in the menu, it sure is one of the most indulgent and yummy. I remembered my friend, the Lechon Diva D who loves pork intestines so much that her trip to Singapore will never be complete if she wasn't able to have plate of fried pork intestines. 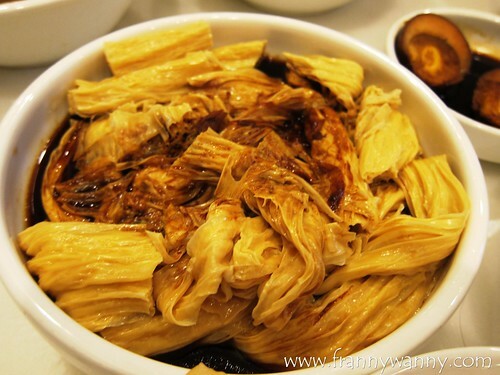 The one at Founder Bak Kut Teh is the soy braised type and it takes very much like Pata Tim. I initially thought I'd just have a few pieces but no, once I started with the first piece, it was just so good that you can't resist digging in for more. 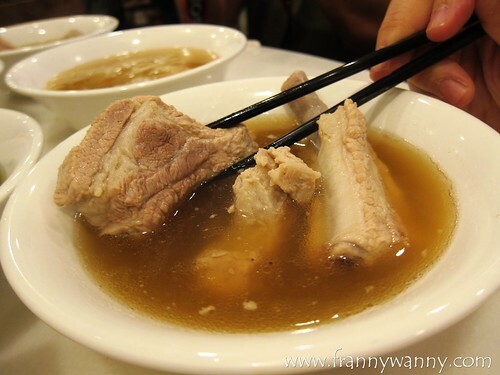 We also tried the Slice Lean Meat Soup (S$7.80) which had a very clean, refreshing taste. It's the type that you can surely enjoy a bowl and not feel guilty after. I initially thought it would be a boring bowl of soup as compared to the famous bak kut teh but I was wrong...so wrong. The soup has that signature peppery flavor and the lean meat was so tender that you'll surely love it. I'm glad I went and tried this or else I would be missing out a lot. 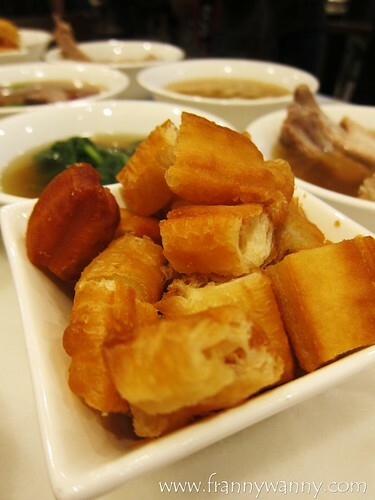 Lastly, what's a bowl of bak kut teh without some fried You Tiao (S$2.50). I never thought you can have these deep-fried flour fritters with bak kut teh since I was so used to seeing this paired with a bowl of congee. Apparently, the way to enjoy this is to get a piece and dip it into your bak kut teh soup. I tried it and I was instantly a convert! I'm so happy to be able to finally visit Founder Bak Kut Teh and now I know why it has remain to be one of Singapore's dining go-to places for the past decades. At least, there's no need to travel all the way to the north as we got one just at the middle of town. 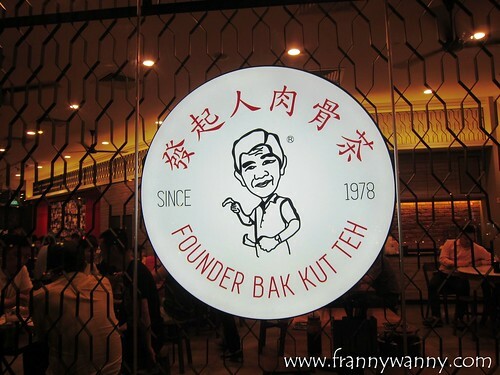 Check out Founder Bak Kut Teh at 500 Jalan Sultan, #01-09 Hotel Boss, Singapore 199020. Call them at 6816-2582. They also have a branch in Indonesia and their flagship outlet is in Balestier Road.